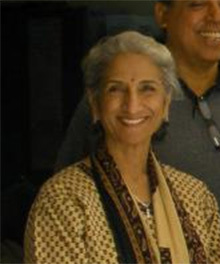 Dr. Geetha Jayaram has dedicated her life to helping people in her native India and the United States overcome the torment of severe depression, bipolar disorder, panic attacks, and other mental illnesses. She is a psychiatrist and associate professor at the Johns Hopkins School of Medicine and the Armstrong Institute for Patient Safety and Quality. You’ll have a chance to hear Jayaram during the 2015 Rotary Convention in São Paulo, where she will be honored with the 2014-15 Rotary Foundation Global Alumni Service to Humanity Award on 8 June. Inspiring speakers are just one of the many reasons Rotary members attend a convention. Register now to take advantage of special pricing through 31 March. This entry was posted in Convention and tagged #ricon15, alumni by Rotary International. Bookmark the permalink. Dear Sir, Tq v m. Dr Elangovan Subbiah. RC KINTA,Dist 3300. Malaysia.